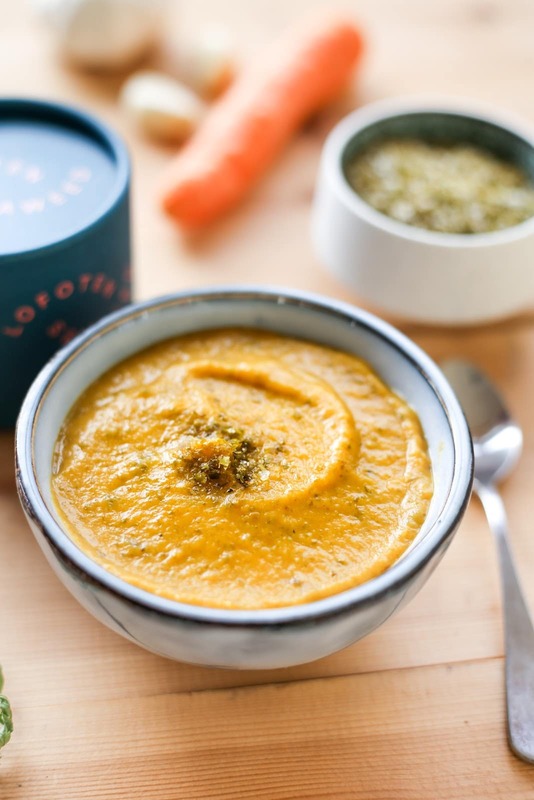 Sweet potato and Squash Soup with Sugar Kelp - Lofoten Seaweed | From Lofoten, Weed Love. 1. Heat a large pot and melt the butter. Add onion and cook until golden on medium heat. Add garlic and leek, cook for 5 minutes or until aromatic. 2. Add remaining diced vegetables and mix to coat in butter. Lower heat and stir occasionally for 10 minutes or until the vegetables have softened at the edges. 3. Place dry sugar kelp in a bowl of water to rehydrate. After 7-10 minutes remove the now re-hydrated sugar kelp and pat dry. Dice the sugar kelp. 4. Add nutmeg, sugar kelp salt and diced sugar kelp to your pot and stir through well. Place a lid on your pot and let cook for 5 minutes. Add stock and hot water to your pot and let simmer with the lid on for 20 minutes. Stir your pot occasionally. 5. Once all vegetables are cooked through transfer to a food processor and blend until creamy. This can be done in small batches to be sure all lumps are blended out. 6. Once all the soup is blended add pepper to taste. 7. Serve with your favorite bread and enjoy!